The new Richard Gilder Center for Science, Education, and Innovation completes American Museum of Natural History building group with a new entrance, and science and exhibition spaces. The new Gilder Center will replace the Museum’s existing loading dock and service buildings to create the Museum’s new Columbus Avenue entrance. Visitors will enter to a light filled, expressive atrium with surrounding theater space, a vivarium and research spaces, to create an exciting new educational experience. Expressing the Museum’s mission towards sustainability and preservation, the project optimizes both HVAC systems and the building envelope design to improve energy performance. 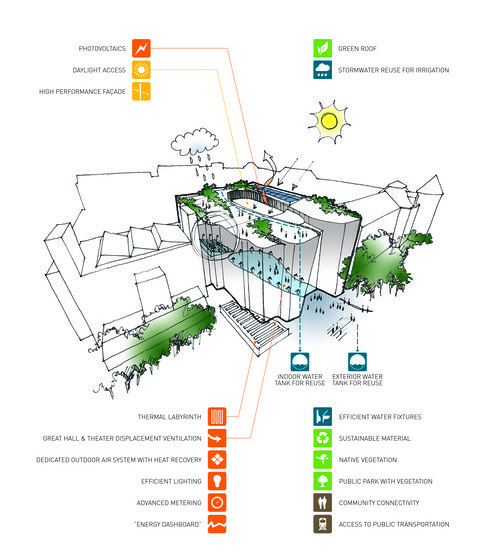 The Gilder Center is expected to have 25% energy cost savings over ASHRAE 90.1-2010. Additionally, with close attention to creating a healthy indoor environment, the team carefully selected sustainable materials, and provided plenty daylight to the atrium and program spaces to create a visually comfortable space for all visitors. The LEED Gold targeted project will be an instrumental part in the Museum’s larger commitment to greenhouse gas reduction goals.